Many iPhone WiFi Transfer users ask us whether the app works or not if there is no WiFi network. We have answered such questions in the formal article in general. If your devices is iOS 5 or above, the Hotspot can plays the role of WiFi network. How much do you know about Hotspot? Or do you know how to connect two iOS devices together with the Hotspot? In this article, we will show something about Hotspot and how to connect two iOS devices without iTunes, USB cable and WiFi network. Then come to how to connect iOS devices with Personal Hotspot.We will take iPhone and iPad an example. Open the Settings on the home screen of iPhone. Then tap Personal Hotspot in Settings to turn on the Hotspot. Personal Hotspot network requires a password. This feature cannot be disabled. You can change your password with the following steps. Tap Settings > Personal Hotspot (mentioned above) or Settings > General > Cellular Data > Personal Hotspot and then input the password. The password must be at least eight characters. 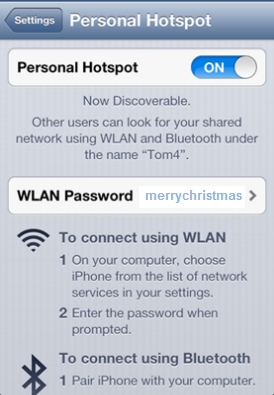 We can join the Personal Hotspot we have launched on the iPhone to another iOS device. Enter the Wi-Fi Password you have set on iPhone. When iPhone and iPad are connected to the same local wireless network created by the Personal Hotspot, you can share photos and videos wirelessly between iPhone and iPad with iPhone WiFi Transfer.